VERRAZZANO (“Janus Verrazanus,” the one extant signature on a deed dated 11 May 1526, now in the archives at Rouen, is generally conceded to be a Latinized form of the original Italian spelling), GIOVANNI DA, explorer, navigator, merchant adventurer, the first European, according to authentic record, to sail the coast of America from Florida to Newfoundland; b. c. 1485 in or near Florence (possibly at Greve) of Piero Andrea da Verrazzano and Fiametta Capelli, both of Florence; d. c. 1528 in the West Indies at the hands of cannibals. Verrazzano’s distinguished lineage has been traced to the early Middle Ages and the last member of the family died in Florence in 1819. Verrazzano had a younger brother, Gerolamo, to whom he must have been close; another, named Bernardo, was a prominent banker in Rome; and two others found in a genealogical register are given as Nicolo and Piero. It is not known if Giovanni ever married. The position of his family as well-to-do merchants and bankers, and his mastery of the elements of navigation and the literary culture revealed in his famous Letter, are sufficient evidence of a superior education. Florence was well able to provide it; she was the golden city, a centre of geographical and navigational science. Her prosperous merchants travelled everywhere in prosecution of trade. The twin pursuits of navigation and commerce quickly occupied Verrazzano’s attention for, imbued with the Renaissance spirit, he developed as a man of enlightened thought and imaginative action. As a young man he lived in Cairo for several years as a commercial agent and doubtless he learned his seamanship in the eastern Mediterranean for he was familiar with these waters, where Columbus also had gained experience. 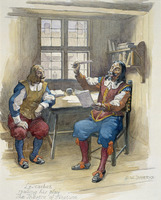 One source, Bacchiani, pictures the young Verrazzano as giving ear to a patriot group “nearly all friends of France, because enemies of the Medici and believers in citizen’s rights.” It is not unreasonable to assume that he left Florence, as did so many Florentines in this period, to escape the repressive atmosphere. There have been suggestions that Verrazzano sailed to America in his early twenties with Thomas Aubert’s famous voyage to Newfoundland in 1508. It is a possibility sufficiently in character, but the evidence is inconclusive. 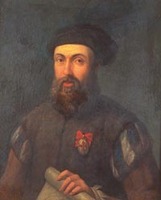 Murphy, Buckingham Smith, and others have identified the navigator with a corsair, named Jean Florin or Florentin (the Florentine), who operated against Spanish and Portuguese treasure ships during these years but Prospero Peragallo has effectively shown this to be a confusion of personalities. Verrazzano was not idle however; indeed one contemporary, writing after the navigator’s return from his 1524 voyage, refers to his travels in Egypt and Syria and “almost through all the known world, and thence by reason of his merit is esteemed another Amerigo Vespucci; another Ferdinand Magellan and even more” (Carli letter). Apart from these speculations, there are no known records to enlighten us further on Verrazzano’s early life. When Verrazzano entered the maritime service of France is uncertain; the earliest documentary evidence placing him in that country is a report of 1522 from Portuguese merchants in France to their king, where it is said that Verrazzano is quietly soliciting the support of François I for a voyage. It was the eager desire of the age for a sea route westwards to the riches of China and the East Indies, and particularly the French king’s ambition to have a share in the Iberian glories and profits of the New World, that presented Verrazzano with his opportunity. Though a continent south of the latitude of Florida seemed to bar the way to the east, the region northwards to Cape Breton, so far as surviving narrative indicates, was unexplored; here there was still hope for both a passage and new lands. The account of Verrazzano’s voyage to this area is told in versions of a letter or relation he wrote to François I, who commissioned the voyage – the first to America under official French auspices. The Letter is dated on board his ship, 8 July 1524, immediately upon his return to Dieppe. Although the autographic original has disappeared (it may yet be found), four Italian versions are extant. One is printed in Ramusio, and another is a transcribed codex found in the Strozzi Library, Florence, together with the Carli letter; there is also a manuscript fragment of this text in the Academy at Cimento. It was on the basis of these texts that Smith and Murphy raised the controversy of the latter half of the 19th century, when it was plausibly argued that Verrazzano never reached America and that the Letter was not his work at all. 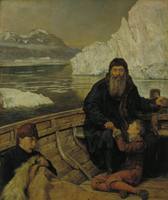 Brevoort, Dexter (in Justin Winsor), and other learned authorities came forward in a strong defence of both the missive and the voyage, restoring confidence in the navigator. After the discovery of the next and most important version, in the Library of Count Giulio de Cèllere, Rome, in 1909 (now in the Pierpont Morgan Library), all suspicions were finally dispelled; this codex bears what are regarded as Verrazzano’s own marginal comments. The last version, a manuscript in the Vatican Library, was reported only in 1925. Still further supporting documents have been discovered in this century, more in fact than during the preceding 350 years. From the Letter we find that its author set out from Dieppe late in 1523 with four ships, but that a storm forced him to find a haven in Brittany with only the Normanda and the Dauphine. After repairs, he skirted the Spanish coast harassing commerce and then, apparently under new orders, resumed his voyage with the Dauphine alone. He set sail from a deserted islet at the westernmost point of the Madeiras (probably Porto Santo) on 17 Jan. 1524 (n.s. 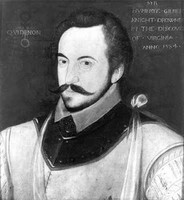 ), with a Norman crew of 50, his tiny caravel armed and victualled for an eight-month voyage. Sailing west on a course about 150 miles north of that of Columbus, he weathered a violent tempest on 24 February, continued west but bearing “somewhat to the north,” and in 25 more days found “a new land never before seen by anyone.” The position of this landfall, given as in 34°, has been variously placed from Florida (for he reported palm trees) to North Carolina, but was probably close to Cape Fear, North Carolina. After a short exploration southward in vain search for a harbour, he turned about, fearing to meet Spaniards, and coasted north as far as Nova Scotia and “near the land which the Britanni (Britons) found,” Cape Breton – without, apparently, observing the Bay of Fundy. He went ashore at several places along the coast, abducted an Indian boy to take back to France, visited New York harbour, and spent 15 days in Narragansett Bay. His Letter records the earliest geographical and topographical description of a continuous North Atlantic coast of America derived from a known exploration, and his observation on the Indians is the first ethnological account of America north of Mexico. 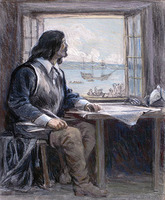 Reaching Newfoundland (“Bacalaia” in the Cèllere version gloss) and finding his provisions failing, he set course for France, making Dieppe early in July 1524 “having discovered six hundred leagues and more of new land.” His six-month voyage is one of the most important in North American exploration. Though it failed to reveal a passage to China, it enabled Verrazzano to be the first to report that the “New World which above I have described is connected together, not adjoining Asia or Africa (which I know to be a certainty).” Here is reasoning based on experience, freed from the ancient teaching of the schools that the Atlantic bathed both European and Asian shores. Verrazzano had, in fact, joined Canada to the rest of America – to the New World. The Letter concludes with a cosmographical description of the voyage, including detailed nautical and astronomical data which demonstrate Verrazzano’s mastery of the scientific methods of the day. Verrazzano’s voyage also left its impression in the nomenclature of subsequent maps, though regrettably almost every one of his place-names has now disappeared. Maggiolo’s 1527 map is the first to use the appellation “Francesca” (François I) for North America and the chart of the navigator’s brother, Gerolamo, is the earliest to show the names New France (“Nova Gallia”) and Norumbega (if this is his “Oranbega”), a name later applied variously within the area between New York and Cape Breton. Both maps therefore record a French influence in North American exploration, due to Verrazzano, several years before Cartier’s first voyage. “Arcadia,” the name Giovanni gave to Maryland or Virginia “on account of the beauty of the trees,” made its first cartographical appearance in the 1548 Gastaldo map and is the only name to survive in Canadian usage. It has a curious history. In the 17th century Champlain fixed its present orthography, with the “r” omitted, and Ganong has shown its gradual progress northwards, in a succession of maps, to its resting place in the Atlantic provinces. Verrazzano’s Letter was dispatched from Dieppe to a banker in Rome, but en route at Lyons its contents were evidently available to the merchants with whom the navigator had contracted for the voyage, since a copy of it accompanied a letter from the Florentine merchant Bernardo Carli, resident in Lyons, to his father in Florence, dated 4 Aug. 1524. The Carli letter contains some interesting, though indirect, hints on Verrazzano’s earlier career and offers the hope of his associates that the king will entrust the navigator “again, with half a dozen good vessels and that he will return to the voyage,” that “he may discover some profitable traffic.” Verrazzano shared this hope and late in 1524 he had another French expedition in readiness for the Indies. The military defeats of France that year, however, left her in no mood for transatlantic enterprises; Verrazzano’s ships and crews were commandeered. The evidence for this proposed voyage includes a record that the king, François I, later compensated its promoters for the loss of their investment. Even so, Hakluyt (“Epistle Dedicatorie” to Divers voyages), in speaking of America, says that Verrazzano “had been thrise on that coast” – though this may have reference to the Aubert voyage of 1508. In the same place Hakluyt refers to a map of Verrazzano “which he gave to King Henrie the eight,” perhaps implying a visit to England, and it has even been argued that Verrazzano sailed in King Henry’s service after his first voyage. This possibility is not countenanced by Bacchiani, but his arguments are unconvincing. It appears probable, nevertheless, that the navigator made only two voyages to America. The final voyage, also under royal auspices, was planned in 1526; it is attested in a contract of that year by Chabot, the admiral of France, with Verrazzano and other speculators to furnish three vessels (two of them the king’s) to make a trading voyage to the Indies for spices. Our navigator, as chief pilot, was to receive one-sixth of the fruits of the venture after certain expenses had been deducted. Other documents corroborate the voyage; one, a deed dated 11 May 1526, signed “Janus Verrazanus” in the Latin form (an aspect of his Renaissance classicism), is his only known autograph. Preserved in the archives at Rouen, a facsimile appears in Winsor. The deed appoints his brother Gerolamo his heir and attorney during the proposed mission. Another object of the voyage, besides trade, was to search for the elusive passage to Asia south of the region explored in the first journey. All was apparently ready in 1526, yet the start was unaccountably delayed for nearly two years. The arguments for a 1526 expedition, mainly liturgical (the naming of geographical features for the feast days on which they were discovered) are not demonstrable. The cause of the delay is still a matter of conjecture. With Darien as its likely first destination, the fleet at last set its course in the spring of 1528 for Florida, the Bahamas, and the Lesser Antilles. On an island in the latter group, probably near Guadeloupe, Verrazzano landed with a party and was taken by Caribs, killed, and eaten within sight of his crew. The event is recorded in Ramusio, in Paolo Giovio’s Elogia (Florence, 1548; Basel, 1575, copy in Library of Congress), and in a manuscript poem (in the Museo Civico, Como) by Paolo’s nephew Giulio Giovio. Many have inferred that Gerolamo was an eye-witness to his brother’s shocking death. Among a group of edicts passed by the Parlement of Normandy in 1532, concerning the financing, fitting out, and lading with trade goods of Verrazzano’s fleet is one which reveals an interesting sequel to his last voyage. It records the unlading from La Flamengue, the navigator’s vessel, at Fécamp in March 1530, of a cargo of brazil-wood. From the context we know, therefore, that Verrazzano’s own ship returned in 1530, and that it definitely visited the Caribbean area – perhaps while Verrazzano was still alive. The primary sources for the voyages are the Letter in its four versions: Cèllere codex (probably 1524), first printed by A. Bacchiani, with commentary, in Soc. geogr. ital. Bollett., XLVI (1909), 1274–1323, facsimile in Stokes [infra], II, plates 60–81, and tr. by E. H. Hall, in Stokes, IV, 15–19. G. B. Ramusio, Terzo volume delle navigationi et viaggi nel quale si contengono Le Navigationi al Mondo Nuovo . . . (1st ed., Venetia, 1556), III, 420–22; tr. in Hakluyt, Divers voyages (1850), 55–71. Strozzi, or Florentine, codex (late 16th cent. ), tr. by J. G. Cogswell in N.Y. Hist. Soc. Coll., 2nd ser., I (1841), 37–67. Vatican codex (presumably 16th c.), unpublished, but photostatic copy in Pierpont Morgan Library, New York. The Carli letter and Chabot agreement are appended to Murphy [infra], with his tr. Reproductions of the Maggiolo, G. da Verrazzano, and Gastaldo maps are in Stevenson [infra]. PAC has a Gastaldo 1548 Ptolemy. Pierpont Morgan Library has the Bailly globe, and the N.Y. Hist. Soc. the Ulpius globe. Some secondary sources are: Bacchiani, commentary [supra]; and “I fratelli da Verrazzano,” Soc. geogr. ital. Bollett, LXII (1925), 373–400. J. C. Brevoort, Verrazano the navigator (Albany, 1874). Ganong, “Crucial maps, III.” Hakluyt, “Discourse on western planting.” The iconography of Manhattan Island, 1498–1909, comp. I. N. P. Stokes (6v., New York, 1915–28), IV, 15–19. H. C. Murphy, The voyage of Verrazzano (New York, 1875). P. Peragallo, “Intorno alla supposta identità di Giovanni Verrazzano,” Soc. geogr. ital. Memorie, VII, Rome, 1897, 165–89. Buckingham Smith, An inquiry into the authenticity of documents . . . (New York, 1864). E. L. Stevenson, Maps illustrating early discovery and exploration in America, 1502–1530 (New Brunswick, N.J., 1903). Justin Winsor, Narrative and critical history of America (8v., Boston, 1884–89), IV. Consulted: L. C. Wroth, study of Verrazzano and his voyages, in preparation. William F. E. Morley, “VERRAZZANO, GIOVANNI DA,” in Dictionary of Canadian Biography, vol. 1, University of Toronto/Université Laval, 2003–, accessed April 24, 2019, http://www.biographi.ca/en/bio/verrazzano_giovanni_da_1E.html.